Calling all cookie lovers! When I was a little girl, I joined the Girl Scouts as a Brownie Scout and participated until I was in fifth grade. I always loved selling cookies, but in my town, we would sell door to door to our neighbors. It is quite the opposite in California, so I learned after my first year here that I had to find where the Girl Scouts would be selling cookies. I gotta have myself some Thin Mints! 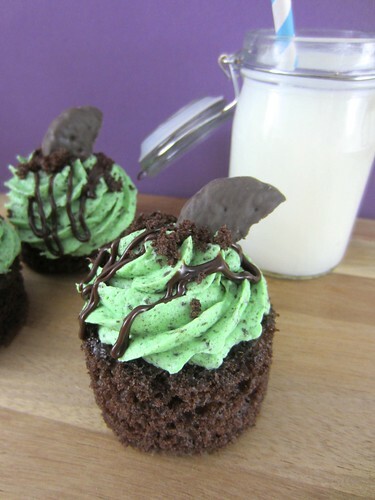 I wanted to try something different with my Thin Mints this year, and since I am a major fan of frosting, I thought this would be a no brainer. 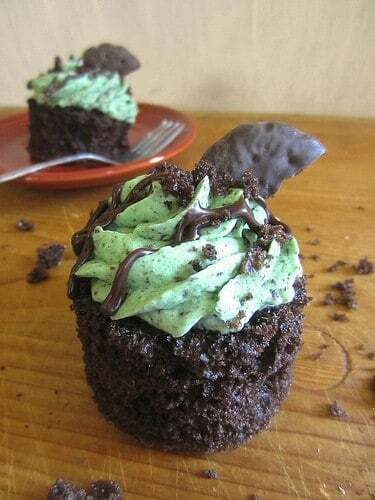 I am absolutely in love with these, because the combination of the cake and the frosting reminds me of mint chip ice cream; which is my all time favorite ice cream. I used my go-to chocolate cake recipe from the Cake Mix Doctor and baked it in a 9×13” pan. You can plan this out ahead of time by deciding what size cakes you are going to make to see how many you will get out of your pan. My recipe makes 12 mini cakes. Mix all ingredients until well incorporated. Pour into 9”x13” pan and bake according to package instructions. Allow cake to cool completely before cutting. To make the frosting, put a sleeve of cookies into a food processor and pulse until the cookies are broken into small crumbs. You will want to make sure your crumb are finer than this if you plan to use a frosting tip with a small opening. Cream the butter until smooth and slowly add confectionary sugar. After 3 cups of sugar you will want to add a tbsp of milk to help the frosting cream together. Continue to add powdered sugar, and add another tbsp of milk when it starts to get too stiff. Cream together until smooth and add mint extract. I used a very small amount of mint flavor because I wanted the cookies to be the real mint flavor. Lastly, tint the mixture with green food coloring if desired. 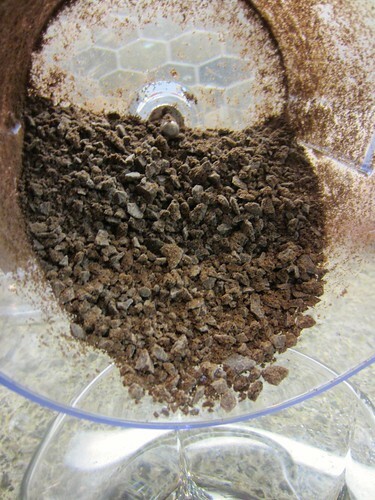 Use a heatproof bowl to melt the chocolate and heavy cream over a pot of simmering water, stirring constantly. Once melted, allow the chocolate to cool to room temperature before use. To assemble your mini cakes, use a circle cutter or the rim of a drinking glass to cut out your mini cakes. I found it more helpful to use a cookie cutter because this cake is extremely moist. When using a glass it can be difficult to get your punched cake circle out, but with a cookie cutter you can just pop it out of the cutter with your finger. My circle cutter is 2.5” wide. 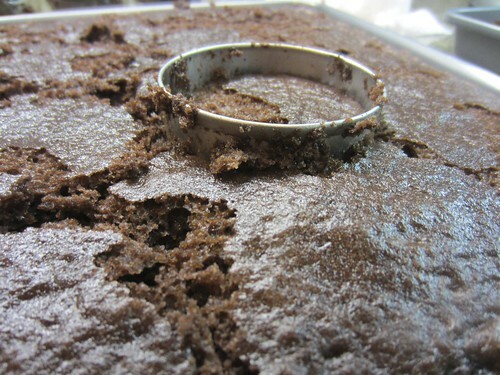 I suggest to also clean the cutter every couple of cuts so that it will make a clean cut in your cake. Don’t forget to save your crumbs, you can sprinkle them over your frosting! 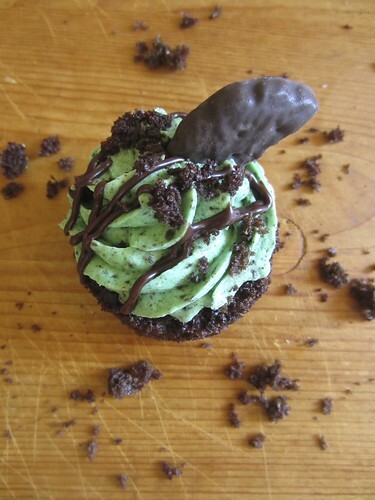 Fill your piping bag with frosting and frost the top of your cupcake. Top it off with a spoon full of ganache and some cake crumbs. Stick a cookie in the top and call it a day. I feel the need to always have ganache on my desserts; they seem naked without it. One thing to note is that if you are preparing these far in advance, you need to store them in an air tight container to help keep the edges of your cake moist, as they will dry out if let exposed to the open air for to long. So if you used one sleeve of cookies for the frosting, and a few cookies to top off your cake with, that mean’s you should have a few extras for yourself! 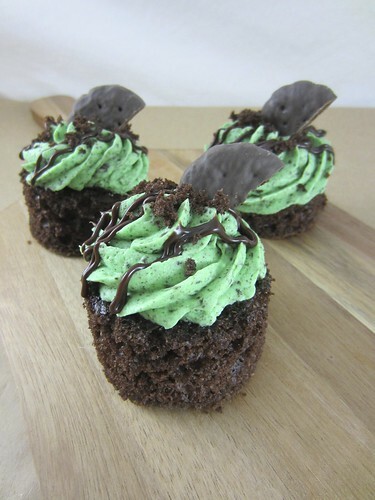 This recipe is perfect for the Girl Scout tea party I’m having for my granddaughter’s troop! Samoa shooters recipe too. The girls and Moms are gonna love this! Thanks! Can I make this as cupcakes with traditional cupcake liners? I was wondering if they would turn out the same way or if you cut them into mini cakes for a reason. Thanks! Of coarse! I just made them this way to be a little different than a cupcake. These look fantastic. I adore this girl scout cookie! Thank you! This is one of my favorite cookies, you literally need to pry the box out of my hand! Hi Amy, thank so you much!!! 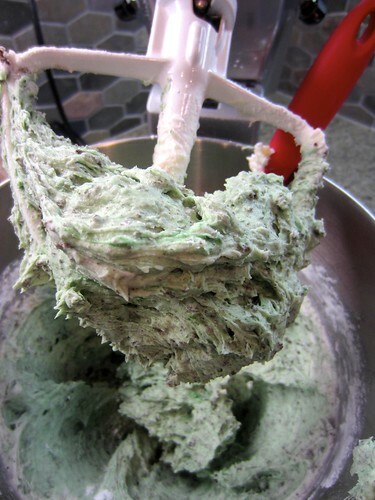 You need to try this if you like mint chip ice cream! These are some of the coolest girl scout cookies there are and this is a seriously nice recipe! !